This Christmas, organic chocolate makers Green & Black’s, will delight chocolate lovers across the UK with the launch of a whole range of delicious gifts. Whether you are looking for a stocking filler or a thank you to give to generous hosts over the party season, the gifting range by the London chocolate makers offers something for every taste and budget. The chocolate selections are the perfect gift for those difficult-to-buy-for and a fabulous treat to share with friends and family allowing your loved ones to experience a little bit of Green & Black’s deliciousness during the festive season. We got to try the Ultimate Collection and were more than impressed with the quality of the chocolate and their beautiful presentation. When opening the box you discover a mouth-watering puzzle of fifteem Green & Black’s bars in a variety of sizes and flavours, with favourites such as Butterscotch, Milk, Cherry and Dark 70% alongside the exclusive new Dark Hazelnut flavour, which was one of my absolute favourites. We found the Ultimate Collection to offer something for everyone’s taste and and the perfect treat for a cold winter’s evening. With its beautiful gift box it makes the perfect Christmas gift for the chocolate connoisseur in your life or an indulgent treat for yourself and your loved ones! The box retails at £14.99 and is available in all good supermarkets. Disclosure: We received a box of the Ultimate Selection for the purpose of this review. Our opinion has not been influenced by Green & Black’s and is as always honest and based on our personal experience. 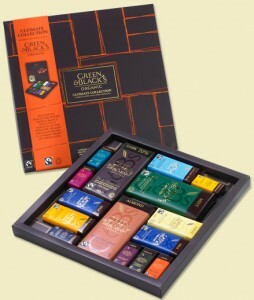 These look so good – love green and blacks! Wow, these look so yummy! !